Maciek Antoniewicz, Centennial Professor in the Department of Chemical and Biomolecular Engineering at the University of Delaware, was inducted into the College of Fellows of the American Institute for Medical and Biological Engineering (AIMBE) on April 9, 2018. 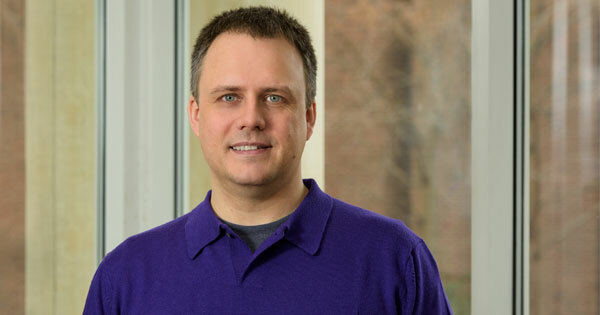 Antoniewicz was selected for “pioneering contributions in advancing stable-isotope tracing and quantitative metabolic flux analysis approaches in biomedical and biological engineering,” according to a press release announcing the award. He is one of 156 new Fellows inducted in 2018. “I was very surprised and honored to be elected as an AIMBE Fellow, which includes so many influential and highly established researchers,” said Antoniewicz. At UD, Antoniewicz leads a laboratory that develops novel experimental and computational tools to engineer and understand complex biological processes, such as metabolism and genetic regulation, in microbial and mammalian cells so that they can be applied to a broad range of problems in biotechnology and medicine. For example, Antoniewicz recently designed a set of experiments to measure how cancer cells respond to the loss of hexokinase-2, an enzyme that helps cells metabolize glucose, their food source. The results were published in February in Nature Communications. For another recent project, he used metabolic flux analysis to determine how E. Coli bacterial cells recovered from a major blow. The results were published in Proceedings of the National Academy of Sciences. UD has a strong tradition of biological engineering. Other UD faculty members who belong to AIMBE’s College of Fellows include: Thomas Buchanan, Prasad Dhurjati, Randall Duncan, Dawn Elliott, Kristi Kiick, Kelvin Lee, Abraham Lenhoff, David Martin, Terry Papoutsakis and Millie Sullivan. Papoutsakis, the Unidel Eugene du Pont Chair of Chemical and Biomolecular Engineering at the University of Delaware and a member of the National Academy of Engineering, has collaborated with Antoniewicz on several projects aimed at harnessing biological materials to produce fuel. Papoutsakis added that Antoniewicz’s group has made important contributions towards the development of novel stable-isotope labeling techniques, computational tools, analytical mass spectrometry techniques and experimental approaches for quantifying the in vivo activity of metabolic fluxes. “Importantly, Maciek is a very generous individual to students of all ranks and colleagues, collaborative, intellectually curious, an intellectual powerhouse,” he said. Antoniewicz joined UD in 2007. He earned bachelor’s and master’s degrees in chemical engineering at Delft University of Technology in the Netherlands and his doctoral degree in chemical engineering at Massachusetts Institute of Technology. Other major awards include the Biotechnology and Bioengineering Daniel I.C. Wang Award (2015), Gerard J. Mangone Young Scholars Award of the Francis Alison Society (2012), Outstanding Junior Faculty Member award from UD’s College of Engineering (2012), National Science Foundation (NSF) CAREER Award (2011-2016), James E. Bailey Young Investigator Award in Metabolic Engineering (2008) and DuPont Young Professor Award (2008).